Pixar seems to have the market cornered when it comes to children's flicks, but people forget that years before Woody and Buzz Lightyear stormed onto the scene, movies like Aladdin and The Lion King were a kid's own Citizen Kane. And screw Bo Peep from Toy Story, Ariel and Jasmine were smokin'. 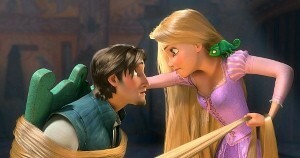 Disney attempts to kick it old-school style with Tangled, an animated film based on the fairytale Rapunzel. Mandy Moore plays the lead damsel in distress, with the dude from Chuck (Zachary Levi) and the brother from Everybody Loves Raymond (Brad Garrett) thrown into the mix. In other words, it's a pretty decent cast, regardless of the fact that that they're just cartoons. The film follows Rapunzel, who was kidnapped when she was a baby by Gothel (Donna Murphy), an old woman who now shields her from the outside world. Of course, every princess needs her knight in shining armor, and that that comes in the form of Flynn (Levi). Before you worry about your young daughters being brainwashed with romantic rubbish, breathe easy. As it turns out, Rapunzel is a modern day woman living in an old-fashioned world. She has so much 'tude throughout the film, you're almost waiting for her to ask the guy "What have you done for me lately?" (Spoiler Alert: They get together). It doesn't matter. Tangled is a film your kids (yes, boys and girls) will love and parents may like even better. It's one of the few movies out there that will be more than tolerable for each member of the family. Child-friendly? Tangled is Disney's retelling of Rapunzel, a story about a princess who is kidnapped and put in a tower for the next 18 years. Her version of Prince Charming, Flynn, comes to save her, but Rapunzel also proves she can make it on her own. The film contains brief mild violence. Recommended for ages 5 and up.